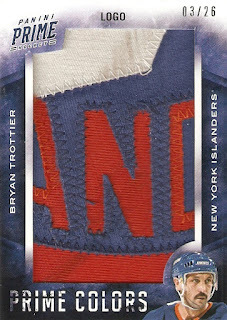 Admittedly, my card-buying has been rare as of late. 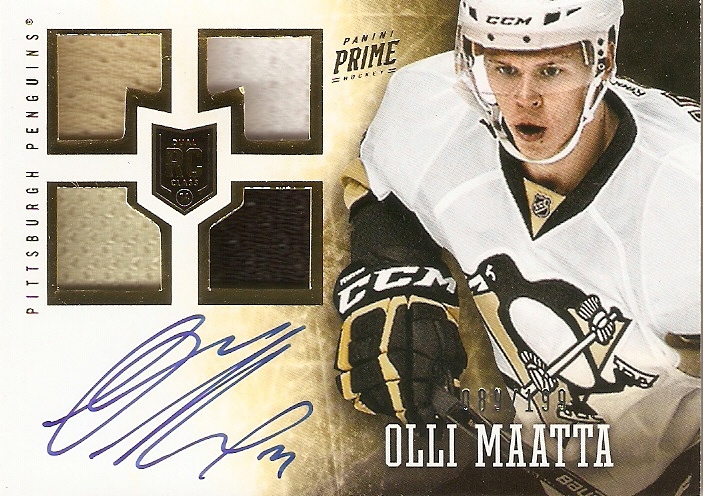 Upper Deck is now the only hockey card on the market, so I haven't been flooded with Panini releases, and they seem to save their biggest products for the second half of the season, so there hasn't been a whole lot that I have gotten excited about. 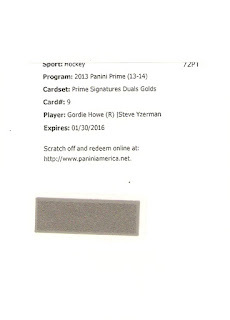 One product that I was looking forward to, however, was SP Game Used. This year, Upper Deck completely re-tooled the brand, taking it from a regular base set brand with a few hits, to a hits-only product. Every single card is either a memorabilia card, an autographed card, or a "base" card that is serial numbered to a player's jersey number. 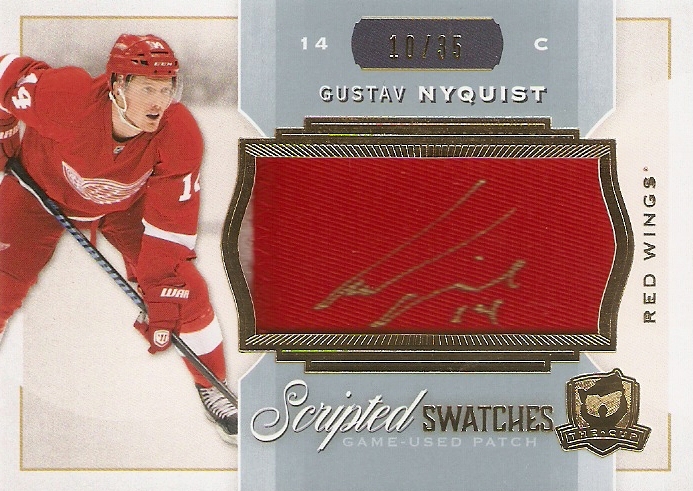 Each box contains one pack of five cards, with one of those five guaranteed to be autographed. Here's what my box got me. 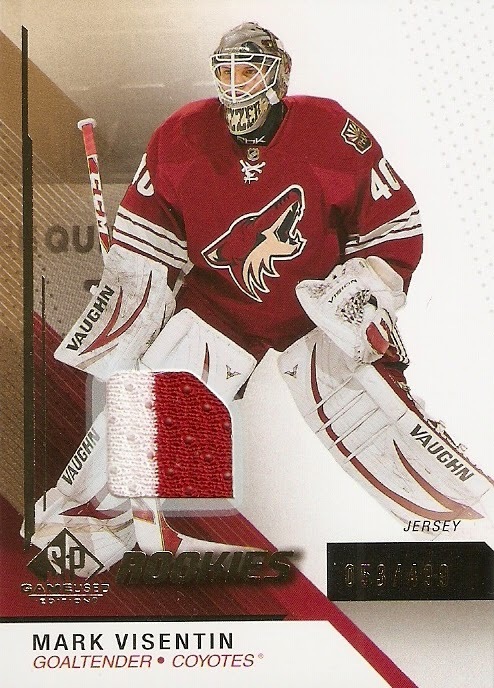 Visentin was the first round draft pick (27th overall) of the Phoenix Coyotes in 2010. The team appears to be giving him time to develop, as he has only made it up to the NHL for one game, which came during the 2013-14 season. He had been playing for the Portland Pirates of the AHL, but is now out for the season following ankle surgery. Nurse is one of the big rookies in this year's product, having been selected seventh overall in the 2013 NHL Entry Draft. He also has an athletic pedigree, being the son of former CFL wide receiver Richard Nurse and a nephew of former NFL quarterback Donovan McNabb. 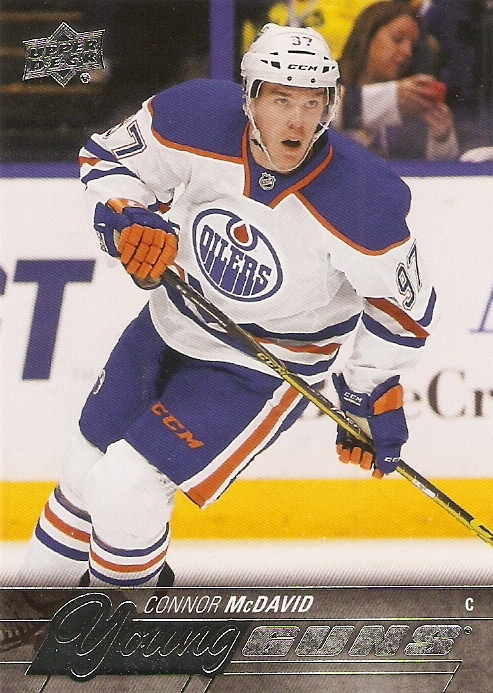 He played in 2 NHL games with the Edmonton Oilers at the beginning of the 2014-15 season, but was sent back to the OHL's Sault Ste. Marie Greyhounds for another year of conditioning. 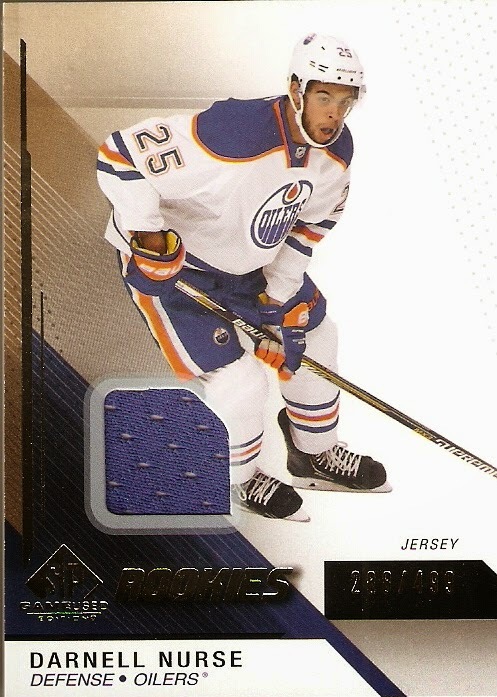 The cool thing with these Stadium Series cards is that the swatches were cut from the actual jerseys worn during the Stadium Series games. This one comes from Chicago Blackhawks defenseman Duncan Keith, who played against the Pittsburgh Penguins in a Stadium Series game held at Chicago's Soldier Field. 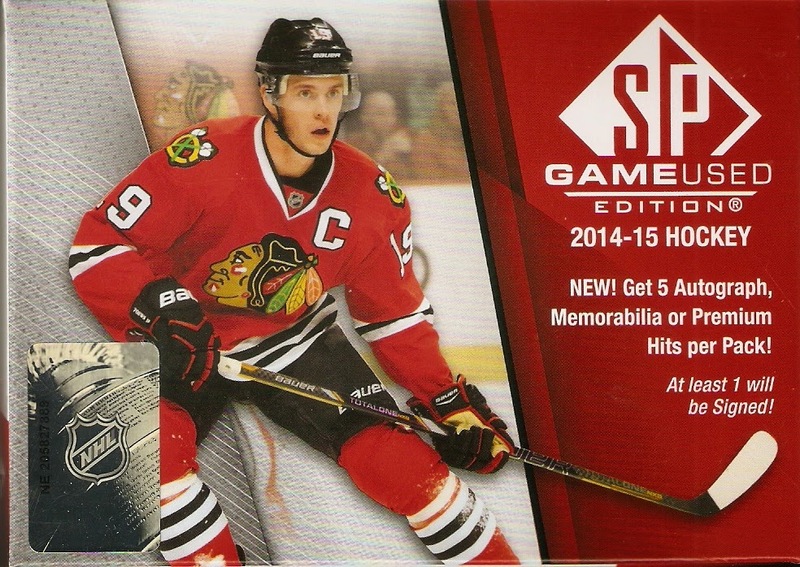 Keith went scoreless in the 5-1 Blackhawks win, but did get 4 PIMs. 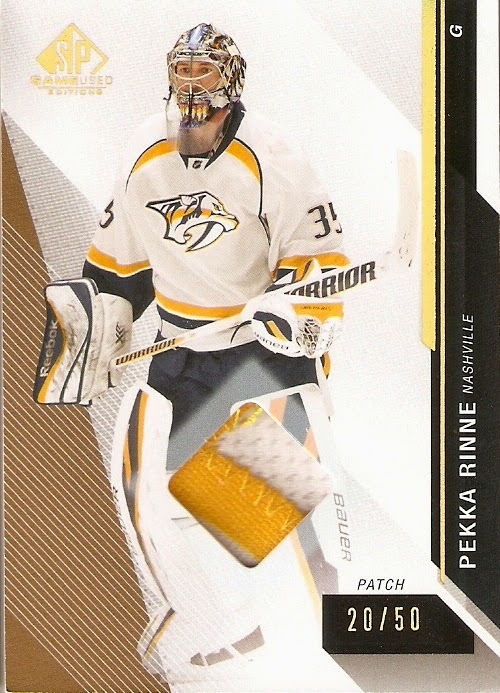 Rinne may have been a late draft pick in 2004 (258th overall), but over the past decade, he has developed into one of the game's top goaltenders, being named a finalist for the Vaezina Trophy, awarded to the NHL's top goaltender, in 2011 and 2012. Rinne is having his best season yet in 2014-15, compiling a staggering record of 29-6-2, with a 1.96 goals against average and a .930 save percentage. So, far, this is only my second hobby box purchase of 2014-15, and already I pull an autograph of the year's top draft pick! 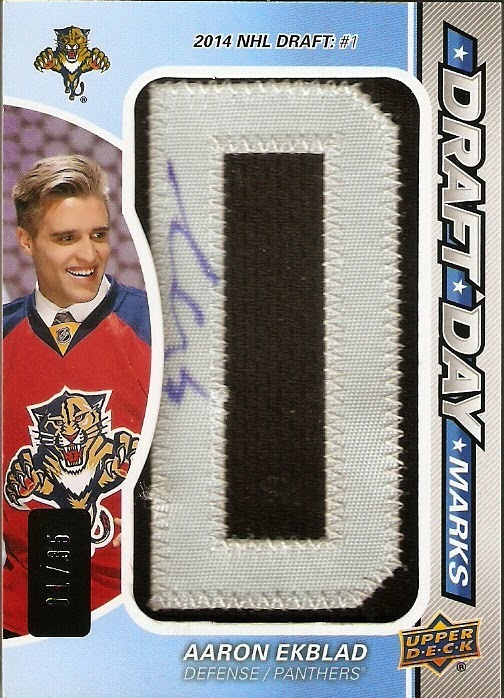 The Florida Panthers picked him first overall this year, and already, Ekblad is making a name for himself. In 44 games, he has totaled 6 goals and 19 assists, for 25 points, putting him tied for fourth in scoring among rookies. This product is definitely a risk, I will say. 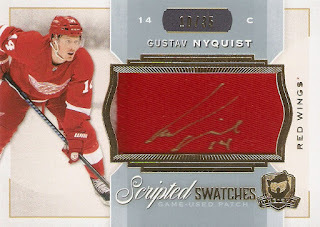 I did pretty well on my box, but I've also seen plenty of boxes with four plain jersey swatches and an autograph of some lower-level rookie. Still, with all the risk, there are plenty of great cards to be had, and I was lucky enough to pull one of them. I know it has been a while since I have posted on here, but a lot of that has to do with the attention I have been giving my autographed memorabilia collection, which is written about on Not Pulled From Packs. I also spent Cristmas driving from Moorhead, MN to Houston, TX with my wife and three girls (ages 6, 3, and 3 months), so my attention (and money) has been focused elsewhere. 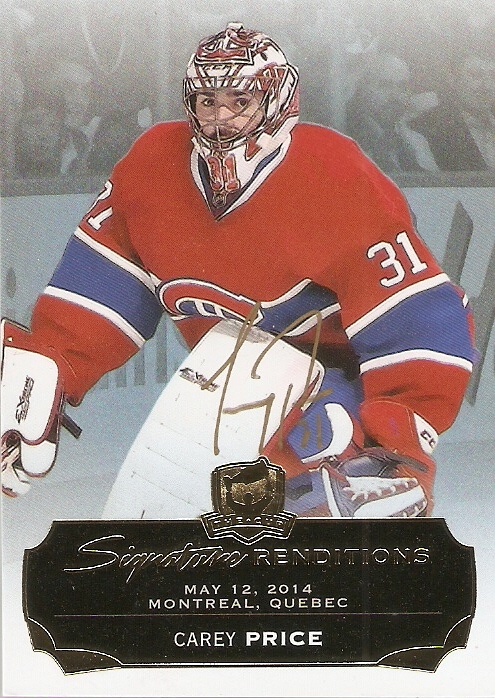 Still, I do like to pick up some cards every now and then, and received an assist under the Christmas tree from "Santa Claus" in the form of a hobby box of 2012-13 Rookie Anthology that he may or may not have found at my LCS for a discounted price. Anyway, I've opened up plenty of boxes of this in the past, so I'll save you the full narrative of what comes in Rookie anthology and get right to it. 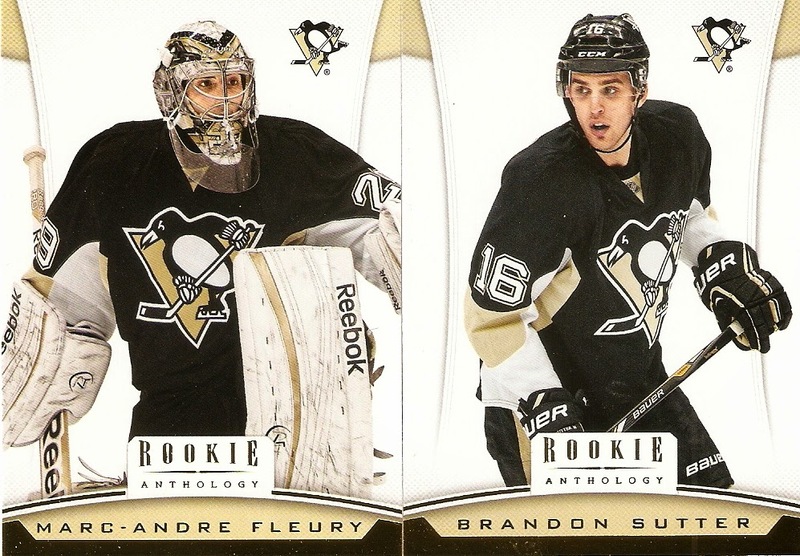 I'm not sure if there's a point to posting base cards, as I've pulled each Penguin multiple times, but this box gave me Marc-Andre Fleury and Brandon Sutter from my favorite team. 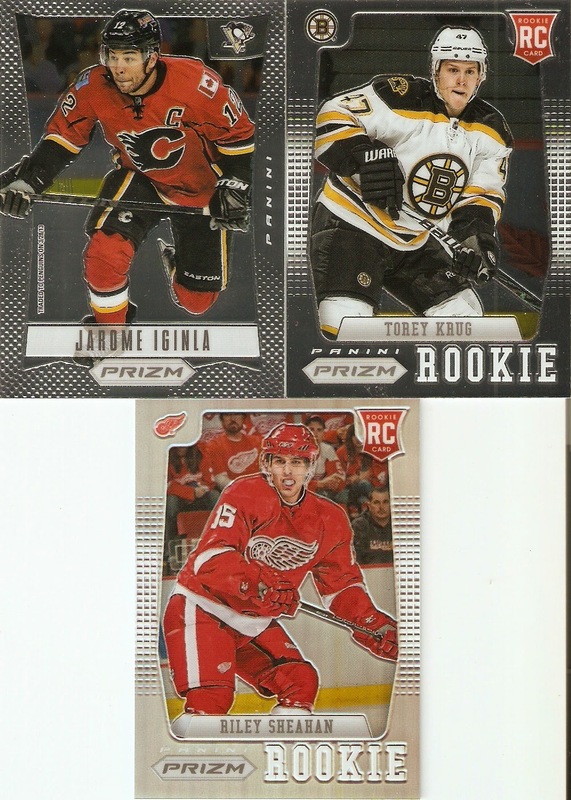 My bonus pack of Prizm gave me a Jarome Iginla, which is kind of a Penguin card, as well as a Torey Krug rookie and a Riley Sheahan rookie refractor. 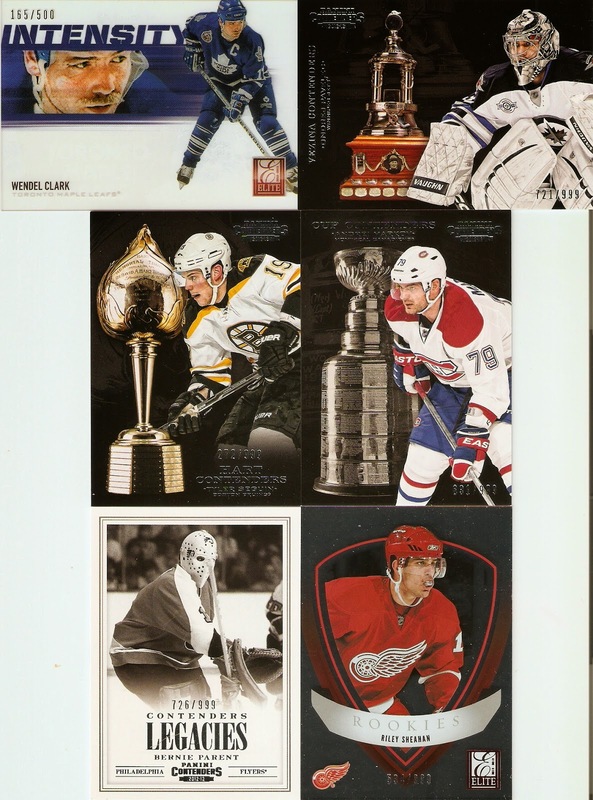 I got mostly the same garden-variety inserts that I had in the past, with one exception, the Wendel Clark Intensity card, numbered 155/500. It's a great looking card, printed on acetate, and gives a close-up view of a player's face as he eyes down his opponent. It isn't the most rare of cards, but for some reason, I don't think I've ever pulled one. 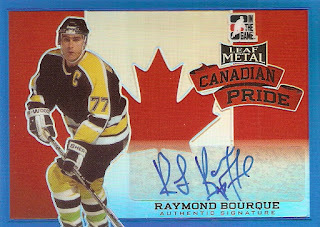 The first of my hits is a Cameron Gaunce Titanium Metallic Marks Bronze card, which I'm pretty sure was a sticker dump. 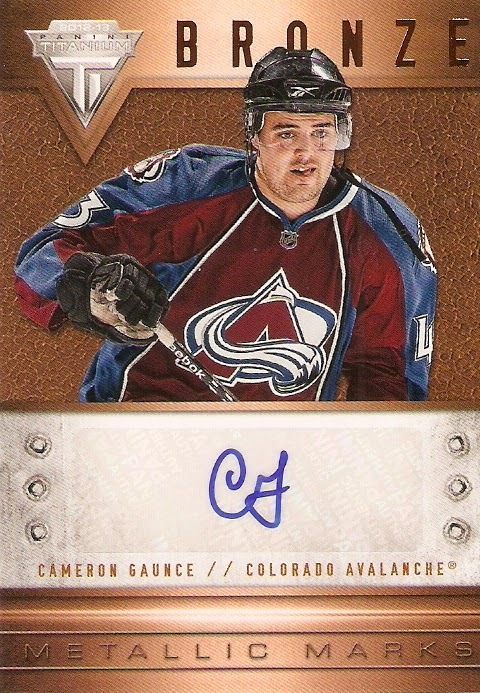 Gaunce played for the Colorado Avalanche for 11 games in 2010-11, and didn't get back to the NHL until 2013-14, when he played 9 games for the Dallas Stars. 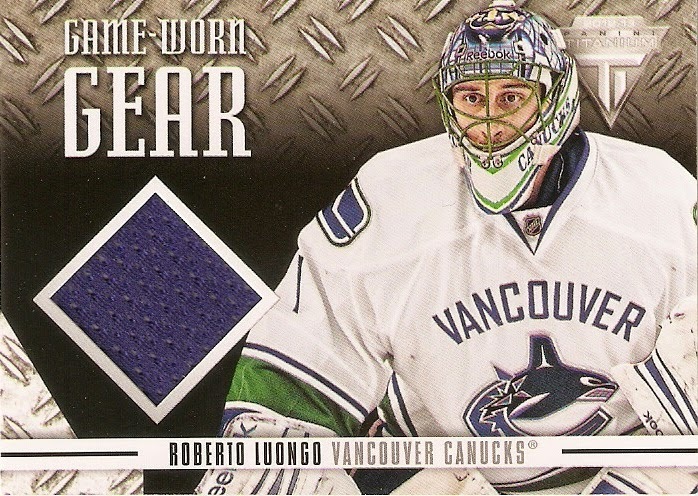 Speaking of Titanium, I also pulled a Roberto Luongo Game-Worn Gear jersey card. 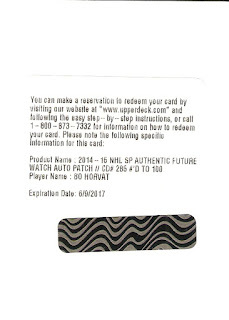 I thought that I already had this card, but looking through what I have, I must have traded my old one away, so it's nice to have it again. 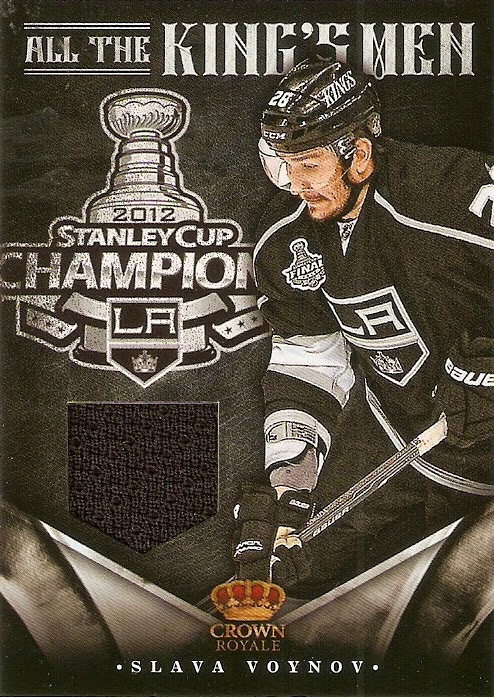 This Slava Voynov All the King's Men jersey card may have been cool at one point, but not so much anymore. The one per-box-guarantee is a Rookie Treasures autographed dual jersey card, and I did pretty good here. 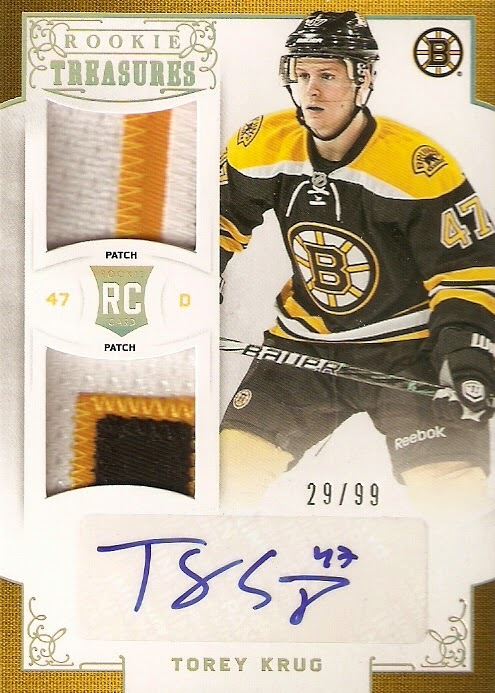 I pulled one of Torey Krug, numbered 29/99, featuring two multi-colored patch pieces. Krug payed just 3 NHL games in total between the 2011-12 and 2012-13 NHL regular seasons, but made a name for himself in the 2012-13 playoffs, scoring 4 goals and 2 assists in 15 postseason games. 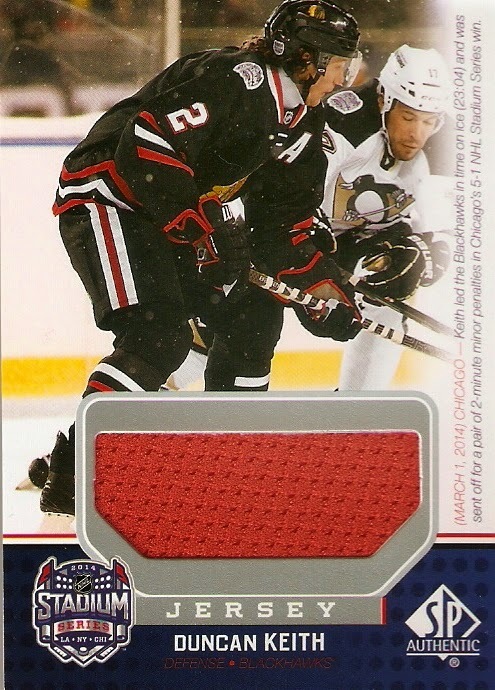 My last hit of the box is a big one, with this Crown Royale Rookie Silhouette card of Brandon Bollig. 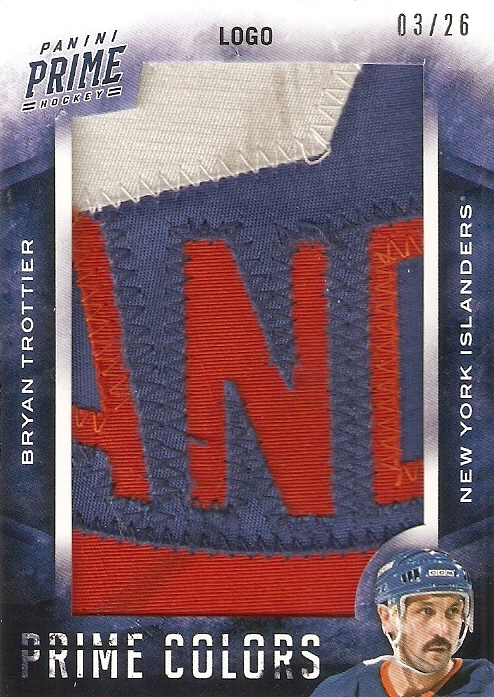 The card features a jumbo patch piece behind a cut-out of the player, right above an on-card autograph. 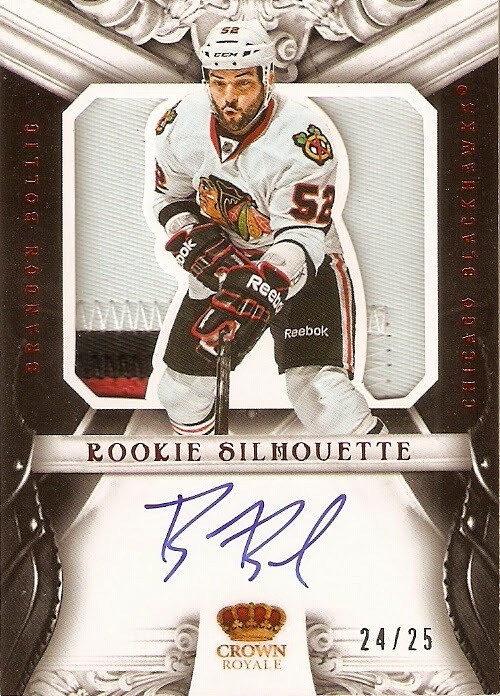 Bollig is currently playing for the Calgary Flames, but made his mark in Chicago while he was there, winning the Stanley Cup with the team in 2013. Overall, this was a pretty good box. 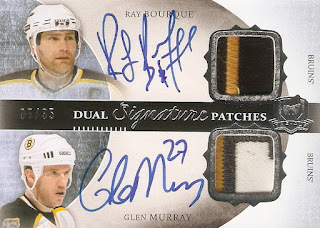 There were plenty of great inserts and a total of five hits, including TWO autographed patch cards. Some boxes can be quite risky, but there have been very few boxes of this particular product that have left me disappointed.